In 2004, ten typhoons made landfall in Japan, and damage due to storm surges and tidal waves occurred frequently around the nation. For instance, Typhoon No. 16 and No. 18 caused widespread inundation damage due to storm surges particularly in the coastal areas of the Seto Inland Sea. In addition, when Typhoon No. 23 approached, record-high tidal waves and storm surges were observed at around Cape Muroto, Kochi Prefecture, and the collapse of a coastal levee and overtopping waves caused human injury and physical damage at Nabae Coast, Kochi Prefecture. To mitigate damage due to storm surges and tidal waves, it is necessary to construct levees and other coastal conservation facilities and prepare hazard maps, as well as support appropriate flood prevention activities and residents' evacuation behavior by providing prognostic information on inundation as the typhoon approaches. Accordingly, a questionnaire for residents was conducted on the necessity of various information on storm surges and the desired timing of information. When Typhoon No. 16 approached in August 2004, record-high tide levels were observed in Takamatsu and Uno, and inundation damage occurred in the coastal areas facing the Seto Inland Sea in Kagawa, Okayama, and other prefectures. Of these damage-stricken areas, two cities where the damage was the greatest were selected, and 232 households were selected at random from the households which suffered inundation damage due to storm surges in Takamatsu City (3,538 households were flooded above floor level and 12,023 households below floor level) and Kurashiki City (2,643 households were flooded above floor level and 1,693 households below floor level), and the heads of these households were requested to fill in the questionnaire form. This questionnaire was conducted from January to February 2005. In the questionnaire, the necessity and desired timing of providing the following four kinds of information were asked. 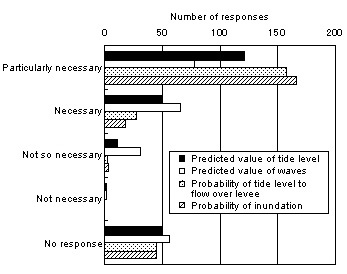 As shown in Figure 1, many respondents answered that all four kinds of information were either "particularly necessary" or "necessary." However, rather than the forecast values of the brunt of external forces, such as tide levels and waves, many respondents answered that information on water overflow and inundation, which are directly related to damage, was "particularly necessary." In coastal areas, inundation can occur merely by waves that swash and flow over the coast even if the tide level does not surpass the levee height, so more detailed information is required, including the swash height of waves, not limited to the forecast values of tide levels and waves. Meanwhile, regarding the desired timing of acquiring the information, comparatively many respondents chose "6 hours prior to the commencement of inundation." As evacuation tends to be dangerous due to strong winds and heavy rain when a typhoon is approaching, this point in time can be a benchmark for information provision. 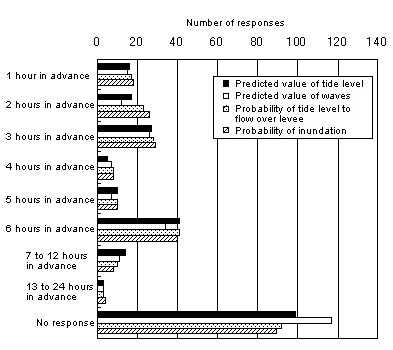 The desired timing of obtaining evacuation advisories issued by the heads of municipal governments was also asked in the questionnaire, for which the responses of 2 to 3 hours prior to the commencement of inundation were the most numerous as shown in Figure 3. In addition, the respondents were asked to select three desired means of information provision, and the most popular means were TV, loudspeaker vehicle, and stationary disaster-prevention loudspeaker in descending order. Partly because the respondents were the heads of households, few respondents chose cell phones and the Internet as the means of information provision. Based on the results of the questionnaire, the Coast Division is developing a shallow sea wave prediction model, which conducts more detailed wave forecasting and hindcasting for coastal areas in real time, as well as a wave swash model, which forecasts the swash height of waves for the respective coasts in real time.